I've done some searching on the forum but can't quite find the answer I'm looking for. Hoping to move my brewing into the basement. Right now I do extract and don't have any plans to brew differently. If I get an induction hot plate with 1800watts, will that be enough to do a 2.5 gallon boil? I'd prefer it not take an hour to get to a boil, of course. I see there are 2000 watt plates as well, though much less common. That should be plenty for partial volume boils. You could also add some insulation to improve performance. In theory, an 1800 watt heater could boil 2.5 gallons, starting at 70 F, in about a half hour. 1800 watts is 6141 btus/hours (not quit 10% of a dark star burner). A btu is the amount of heat needed to raise 1 pound of water one degree F.
2961 btus/ 6141 btus/hr *60min/hr = 29 minutes. That would assume all the heat goes into the water, so I would expect reality to be a bit longer. Sorry for the math and science, but I hope this provides some perspective at least. 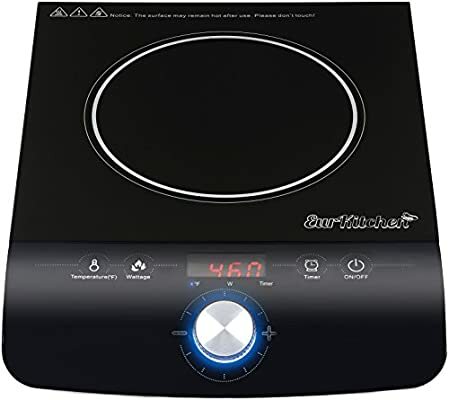 Did you try the induction hot plate and how did it work out? I’m hoping to try a setup very similar for this winter. I haven't gotten around to trying it, but NB has come out with the "Gigawatt" which is pretty much what we discussed, so I'm guessing it works. For those interested it’s here.. Actually called a “gigawort.” I’m just surprised they didn’t make it a little bigger for full boil. Cleaver idea thoug. Has anyone tried the Gigawort yet? It looks like you could do small batch BIAB? I was thinking it may be useful for my son who lives in downtown Boston . He likes to experiment and if 2 or 3 gallon biab batches are possible in this it may be an option for him. It may be an option for me as well to play around with recipe design in small batches without dragging out all my stuff. Does anyone know if you can use an induction hot plate with a regular stainless steal kettle, or does the kettle have to be a certain material? Wondering if something like this with my current kettle would work. I agree with @damian_winter. However, if you can get a magnet to stick to the bottom it can be used with induction. I would make sure you get a “strong” hold with the magnet or it may not transfer the heat very well. If you go induction, get a decent one. Here is a site that often has them on clearance. Why so insistent on induction? Why not just just a nice 2 burner coil? If you are worried about fire potential then I would recommend you clean up your basement before attempting any of this haha. I've read induction is more efficient. Also, I can't seem to find a quality larger coil burner. They all seem to be small and don't last long. Huh, our stove top is induction... My wife has a 3 gallon Stainless Steel stock pot with a thick foot plate on it... And thats how I check for good quality SS, with a magnet... It doesn't stick, and it works well.